I often hear people’s opinion on which language I shall speak to my own child! “Don’t you think we should understand what you’re telling your child?” Well, sure. In case you are included in our conversation. Otherwise, I am speaking to my baby. Stop listening. Am I too harsh? I think somebody telling me how to teach my baby to speak is harsh! I would like my baby to understand his own family – I am Czech and most of my family doesn’t speak or even understand English. My husband is Indian and most of the elders in his family speak Hindi. And me and him communicate mostly in English (if you don’t count that hybrid language of ours as a separate newly invented tongue:). So if we want our child to speak to all his relatives, he will have to learn our native languages. And English will come naturally, it is all around him including our home. Are you skeptical, just like that lady know-it-all in grocery store? How did you learn your language? By listening and looking around! Now it makes sense, doesn’t it? And another story: My grandmother’s parents worked for a few years in Canada where they learnt English. When they had an argument, they fought in English, so their daughter (grandma) wouldn’t understand. Until today she’s sorry they didn’t teach her English. She feels like her opportunities in life could have been different. I grew up in Czechoslovakia, which is now separated into the Czech Republic and Slovakia. Each of the countries, even in union, used a different language (Czech and Slovak). Growing up, we spoke both languages. They were all around, TV was bilingual. We never considered ourselves bilingual, now I know we were, because kids who grew up in Czech Republic after the separation, don’t understand Slovak well anymore. It was easy and natural that we acquired both languages. Babies are little geniuses when it comes to speaking. If you start early, they soak up all you offer! 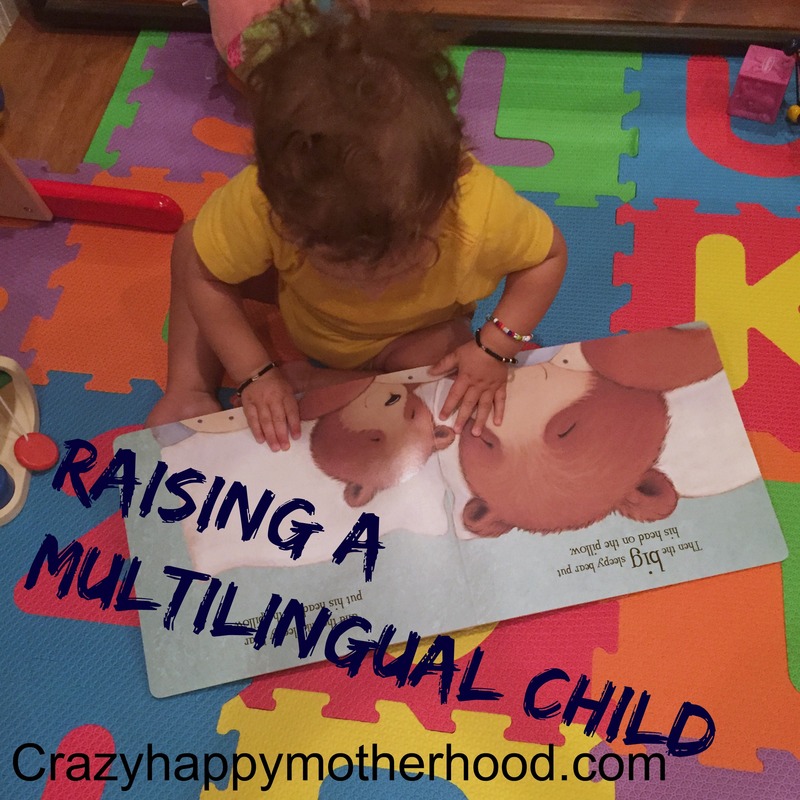 There are, however two different approaches to raising bilingual/ multilingual children. You either are or are not a native speaker of the second language you want to teach your child. You can teach your child a language that is not your native, your child can actually learn a language that you don’t even speak. It’s all about the approach, but I have to stress here, if you are planning to raise your child bilingual, you will be more successful with a plan. There are several myths about bilingualism, let’s have a look at some. A child will become “confused” and mix languages if he learns more than one at a time. >> Mixing is normal, just like kids like to mix games, stories and food, they will be mixing languages if they know more than one. This can actually add to their vocabulary later in life and it will definitely amplify their fantasy! Bilingualism leads to language delay. >> This was one I was told most about, but I never really worried. It seems like kids need to figure things out before they try them and sometimes they take longer (some kids learn to walk by trying and falling, some kids take more time and then all of a sudden start cruising along furniture; same applies to learning other things including language). Maybe your child won’t say much at first and then just spit out a whole sentence, who knows. And he doesn’t even have to be bilingual. Anyway, no scientific research actually confirms that bilingualism leads to language delay. You have to be fluent in languages you’re trying to teach your children. >> Even monolingual parents can raise their child bilingual. You can hire a foreign nanny, enroll them in a language program or learn a new language along with them. The key is consistency and commitment (consistency is the main reason I speak to my child Czech in nearly ANY situation). Children just absorb language passively. >> This is a dangerous myth, if you are really trying to teach your child a different language. To learn a language fluently, brain needs a stimulating environment, so just playing French radio will not “teach” your child French. How many times have you encountered an expat living in a foreign country for years and still barely understanding the native language? A simple immersion doesn’t mean that somebody will learn a language. Participation in the language is stimulating and only then appropriate synapses in brain can be formed. If a child is not very intelligent, he cannot speak more languages. >> A baby’s brain is created to learn ANY language in the world and learn multiple languages if you start early and right. If a child doesn’t speak English by kindergarten, she or he will have difficulty at school and will have problems to read. >> Children take much less effort to learn new things, including languages, than adults. While it is best teaching language skills before the age of 3, children are capable to adapt and learn languages well beyond 5 years of age. At that time it might be more dangerous letting your child concentrate on one language only (the official school language) and not supporting vocabulary development of the other languages your child was speaking and hearing until then. It sounds like it is no easy feat to teach your child multiple languages, but don’t be hard on yourself. Think of a plan and then just flow with it. Remember, you need to work smarter, not harder – it takes a village. Find a foreign language play group, hire a foreign nanny or enroll into a childcare facility that has foreign language programs or has foreign language speaking teachers. Make it a point to get together with your foreign friends more often and let them talk to your child in their language. Let their children play with your child, they will be learning without even knowing it. Employ your language-talented family members for babysitting or find some smart programs that help children acquire richer vocabulary. One such program, that we’re using at home, is Little Reader – your child can learn vocabulary in English, Spanish, French, Russian, Thai or Chinese (traditional or simplified), other language versions will be available with time. Although this program is made to teach children read, smaller kids will still benefit by learning new vocabulary (and learning a new language if you opt for non-English version). What do you think? Are you going to try speaking another language at home or send your child to a language class? Give it a go, you can’t turn back time!